Why do the best-laid plans for organizational transformation go awry? In this compelling work, Dorothy Marcic tells managers that no prescribed formula is ever complete without factoring in the human side of the equation. 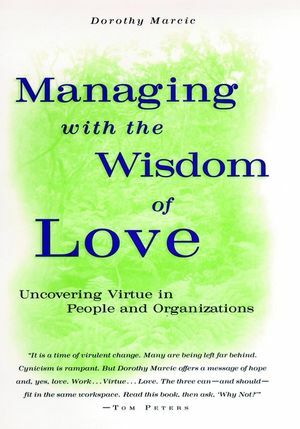 She asks, How would the workplace change if we acknowledged that spiritual values are as important in the operations of organizations as they are in the lives of the people who work there? The answers -- garnered from real-world examples -- banish the notion that a business can't be both spiritual AND successful, and show what it means to act as a manager with virtue. DOROTHY MARCIC is director, graduate programs, human resource development, Peabody College, Vanderbilt University. She also heads her own company, DM Systems, Ltd., and has consulted to organizations including AT&T Labs, the U.S. Department of State, and the Czech Ministry of Finance. She lives in Nashville, Tennessee. "This book is a must for those in leadership positions who are committed to establishing people- and team-centered organizations that are truly empowered." -Carl M. Skoogland, Vice President, Ethics Director, Texas Instruments Inc.